Seasons in the Park, that’s Queen Elizabeth Park, has a lovely garden setting. Set atop a high point in Vancouver that overlooks the downtown and North Shore mountains, you have a visual feast for your eyes out the window, as well as on your plate and in your glass. In case you did not know, Seasons has a wine bar, where they have featured tastings. Their next series of tastings are upcoming starting in March. Below is the announcement from Seasons about their wine and whisky tastings. Enjoy! On Tuesday, March 12th, we will begin yet another fantastic series of tastings in the Seasons Winebar! At the Seasons Winebar, we welcome guests of all interests! March through September, we host a variety of tasting events every other Tuesday night. Join us as we celebrate some amazing wine, spirits and delicious chef-made creations. Week to week, our tastings reflect some of the best products that we and our partners have to offer. So join us for a unique, enjoyable and memorable experience in the Seasons Winebar! Here is the link to find out more about these tastings. Have You Tasted Spicebox Canadian Whiskey? This week I was invited to a tasting of Spicebox Canadian whiskey. The whiskey is first made in Alberta then brought to Quebec for further blending and finishing before being bottled. Truly made in Canada. In Prohibition days in the United States, Canadian alcohol, such as whiskey was smuggled down south. The whiskey was hidden inside boxes containing spices; and viola, Spicebox whiskey the name was born. This evening I first tried the Spicebox whiskey on ice so that I could appreciate the flavours before moving on to the mixed drinks that they were offering. Light amber in colour with quite an aromatic nose. Vanilla on first sniff, followed with sweet spices. Flavours of vanilla, caramel, sweet spices and toffee. Smooth. A bit of sweetness. Nice on the rocks to sip. This is different than other more traditional whiskeys you may have tried, such as Scotch. This is completely different in style. If you have friends that do not like the stronger, bitter, hotter flavours of scotch, then you may want to try Spicebox with them. These are Botanically Brewed Beverages from the UK made starting in 1905, and now in Canada. Here is the link to the Fentimans website. 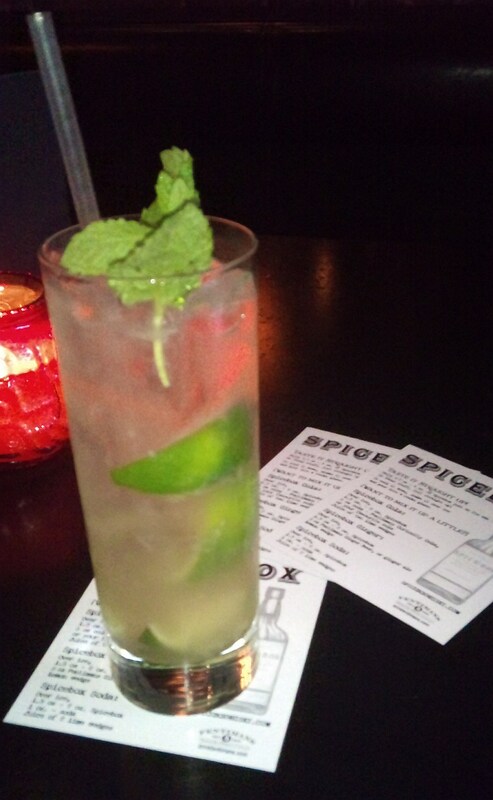 Prohibition Mule – Ingredients: Spicebox Canadian spiced whiskey, fresh lime, Fentimans Ginger beer, mint sprig. Ginger beer is quite spicy. Plays off nicely with smooth vanilla and sweet spices of the whiskey. The sourness of the lime freshens up the flavours and adds another layer of complexity to the drink. Fun to drink. 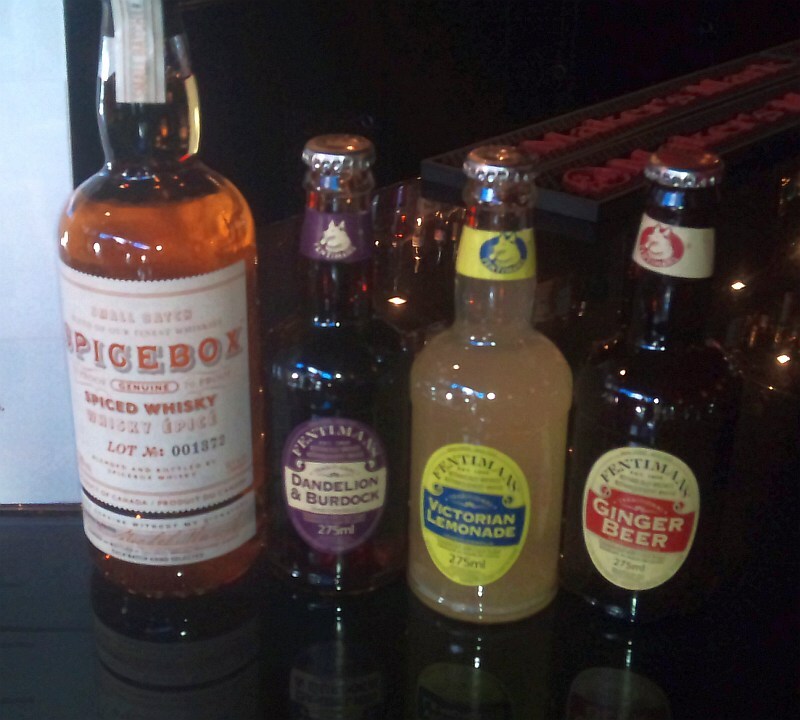 Spicebox Cup – Ingredients: Spicebox Canadian spiced whiskey, strawberries, Fentiman’s Victorian lemonade & Ginger beer. This drink has a very pretty colour due to the crushed strawberries in the glass. The lemonade is not overpowering in the drink. And again the vanilla and sweet spices make this a very flavourful drink. To find out more about Spicebox, here is Spicebox’s Facebook page.